Remember the whimsical childhood sleepover game where you chant into a mirror to try and summon a blood covered murder ghost and see if she will ghost murder all of your friends? 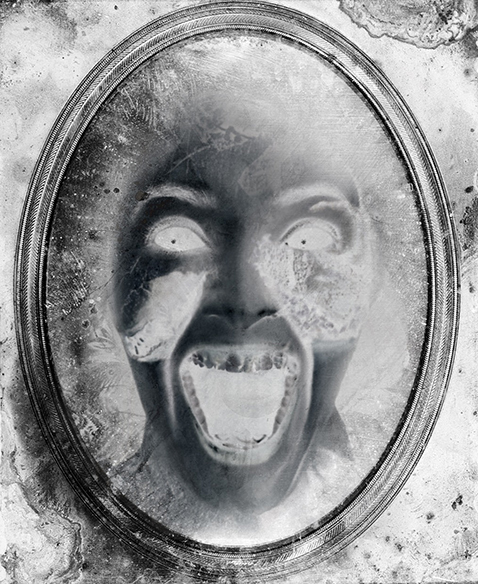 Remember how someone always swore they saw something strange in the mirror? This could be phenomenon known as "your friend is a tiny pathological liar," or it could be the Strange-Face-In-The-Mirror-Illusion. No illusion there. It's just a pre-coffee photo. In a study by Italian scientist Giovanni Caputo, 50 subjects gazed at their reflections for just ten minutes. After less than a minute, most subjects began to see their own facial features distorting into deceased family members, animals, and even monsters. Because reality is a lie and perception is chaotic evil. This disturbing effect is believed to be caused by a spooky cocktail of 1) neural adaptation, which is basically when our brain gets comfortable with a certain stimulus, and 2) Troxler fading, which is when our brain focuses on a certain point and ignores any unchanging variables around it. Put together, these two trick our brains into processing information that doesn't exit, turning any sweet, innocent face into hellish nightmare fuel. Which, incidentally, is how Brock Lesnar makes a living. How all opponents look to Brock Lesnar. When we blink or make involuntary eye movements, our bored brain fills in the gaps of what we should be seeing, based on our conscious or subconscious expectations. So, if a tiny part of you is expecting to see a murder ghost, you might just find out that the murder ghost was inside you all along. Which is the moral behind 72% of all Disney movies. Sleep is a thing your body needs, so you’d think your brain would be on board when you lay down for the night. But of course that’s just what it wants you to think. Hypnagogic hallucinations occur in the state between sleep and waking. They cause you to see, hear, smell, or even feel things that are not real. This can be especially unsettling when combined with their good friend, sleep paralysis. The hallucinations can vary widely just like dreams do, but one common occurrence reported by many sufferers of hypnagogic hallucinations is the sensation of bugs crawling all over their bodies. Combine that with being frozen by sleep paralysis, and you have definitive proof that our brains are evil. "Let's see ... which stock hellscape do we present tonight?" You might think this is a rare mental health issue, but hypnagogic hallucinations are experienced by as much as 25% of the population, and that number is thought to be under-reported, due to the stigma around mental illness. This means, statistically, one in four doctors has hallucinated spiders at some point. So there's a pretty decent chance that your family physician is House. "Halt. Who dares enter Pants Crap Forest?" If you’re terrified of falling asleep now, don’t worry. You can also have hypnopompic hallucinations, which are the exact same thing, but they happen when you’re waking up. For those of you with a fierce devotion to Satan’s favorite board game, we’re sorry to inform you that you can’t really buy a direct line to the underworld for twenty dollars on Amazon. Ouija boards have been around since the spiritualism movements in the 1800s, which is a testament to just how effective the ideomotor effect is. If you’ve ever used a Ouija board, you probably know that part of the game is everyone screaming, “I’m not moving it!” as the planchette indicates that yes, Jamie does think you’re cute. Even to the most skeptical of users, it can really seem like the Ouija board is moving on its own, and that’s because everyone thinks it really is. Your brain has all kinds of sneaky backdoor programming that runs all the time without you even knowing it. Think about when you yank your hand away from a hot stove: did you consciously think about moving your hand first, or did it just sort of happen? The ideomotor response is tiny micro movements that your body makes, which are seemingly reflexive. They’re just so tiny that you don’t realize you’re making them. When you’re playing with a Ouija board, you know what answer you’re secretly hoping for. Even if you don’t believe it’s the ghost of your dead dog passing along the information. Those thoughts subconsciously move tiny muscles in your hand just enough to slide the planchette in the direction you want or expect it to go. The best way to demonstrate the effect of the ideomotor response is through Chevruel’s pendulum, an experiment that Brian and Jason tried out in that big ol' embedded video, above. In 1518 in the city of Strasbourg, France, a woman stepped into the street and started dancing. By the end of the week 34 others had joined her, and within a month a crowd of around 400 people had taken to the streets to dance. Sounds like a fun party, except that these people didn’t stop dancing until dozens of them dropped dead from heart attacks, strokes and sheer exhaustion. This wasn’t the first time the “dancing plague” struck, either. There are documented cases of similar instances happening in 1374. So what could possibly cause 400 people to uncontrollably shake their groove things? Was the town in Footloose right about dancing being evil? Today, this plague is recognized as a mass psychogenic illness. It’s a condition where the suggestion of sickness can manifest symptoms of physical illness in large groups of people. We’ve all experienced feeling our throats get scratchy or our stomach turn sour after a friend tells us they’re sick. Or that that they're huge fans of the movie version of The Last Airbender. Mass psychogenic illness takes that feeling to the next level and actually makes us sick. The symptoms aren't just psychological, either. It causes real physical symptoms like headaches, dizziness, shortness of breath, vomiting and diarrhea. There just isn't an external or viral cause. The people who experienced the dancing plagues were physically unable to prevent their groove things from shaking, because their brains convinced them that was the case. "Symptoms may include REALLY rapid weight loss." You might think this kind of thing doesn't happen anymore, but there was an outbreak at a Tennessee high school in 1998 that sent 71 people to the emergency room. It's also thought to be the cause behind the recent spread of inexplicable illness among American diplomats in Cuba. At this point, it may feel like I’m slapping you in the head with your own hands and chanting, "Stop scaring yourself, stop scaring yourself," but this last one happens for a good reason, I promise. Infrasound is a very low frequency sound, inaudible to humans ... but just because you can't hear it, doesn't mean your brain won’t use it as an excuse to scare you. In nature, infrasound is most often made by things we should be afraid of: large animals, volcanic eruptions, avalanches, storms, meteors and approaching used car salesmen. Since infrasound is inaudible to human ears, our brain warns us of its presence by giving us what is scientifically known as "the creepy crawlies." The presence of Infrasound has been reported to cause feelings of anxiety, depression and general unease. It’s thought to be the scientific explanation for places that feel haunted. That feeling is actually just the presence of infrasound. In 2003 acoustic scientist Richard Lord conducted an experiment that tested the impact of infrasound on 750 people at a concert. He produced the infrasound with a large pipe during some of the songs, and then asked for the audience’s reaction to each song. The audience didn’t know which pieces were laced with infrasound but 22 percent reported feelings of sorrow, fear, and revulsion during those songs. Although, it could also be because those songs were all by John Mayer. Even though our fear of infrasound could have once severed a purpose, today it's just another thing that causes our brain to scare us for no reason. Side note to readers who now have "Shake Your Groove Thing" stuck in their heads: YOU'RE WELCOME.